This is hands-down my FAVORITE way to eat asparagus! What is it about oven roasted asparagus that is so magical?? Add the Balsamic Browned Butter and you will be in heaven. This recipe takes about 15 minutes, tops. It's SO easy and perfect for Easter or as a side dish for any weeknight. Roughly spread out the asparagus onto 2 large baking sheets. Use your hands and toss to coat well. Spread out the asparagus evenly on the two pans. Make sure that each asparagus spear has space to roast; if all the asparagus spears are touching, they will steam instead of roast, and that's not what you want. Try to get them as far away from each other as possible. Roast asparagus at 400° for 10-13 minutes, or just until tender. A fork should slide into a spear, but don't roast so long that it gets mushy. Remember that it will continue cooking a little even after you take it out of the oven. The spears should be bright green and not yet starting to yellow. Meanwhile, melt butter in a small skillet over medium heat. Stir the butter occasionally. It will turn white on top, then it will foam up. Once it is foamy, it will start forming brown colored milk solids or "bits". They will swirl up when you stir. The scent of the butter will change to a "nutty" or toffee like aroma. Once you see brown bits, remove the pan from the heat. Stir in 1 tablespoon each soy sauce and balsamic vinegar. Transfer asparagus to a serving plate. 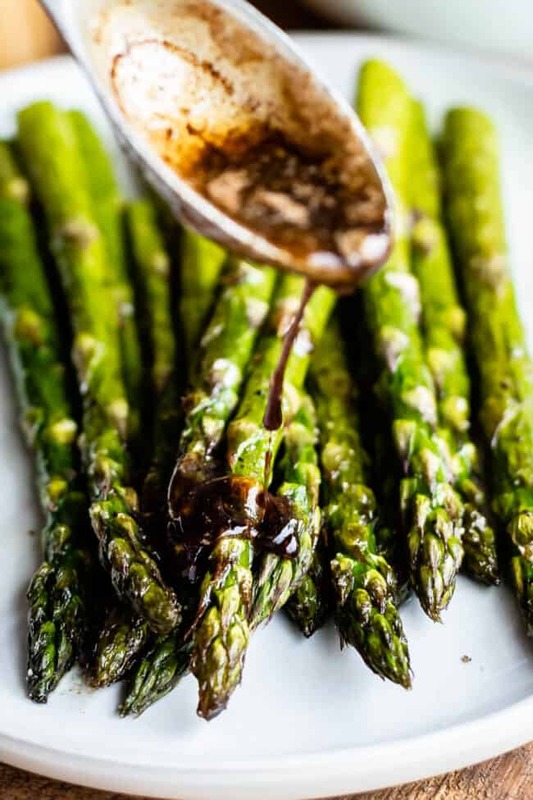 Drizzle sauce over asparagus, tossing to coat. Serve immediately.